Published: April 7, 2019 • Modified: April 24, 2019 • by Author: Analida • Word count:1343 words. • About 7 minutes to read this article. A few years ago, at the university where I work, we had a Moroccan Fullbright student who taught my husband and I how to make a chicken tagine. I was mesmerized by the cooking process, and the results: a delightful flavor, the aroma of my kitchen, and a very tender meat. Ever since, I wanted to make a Moroccan lamb tagine. I must admit, I put this recipe together kind of quickly. My husband and I always like to make lamb for Easter. It’s a tradition. This year was no different, but we wanted to make something different. 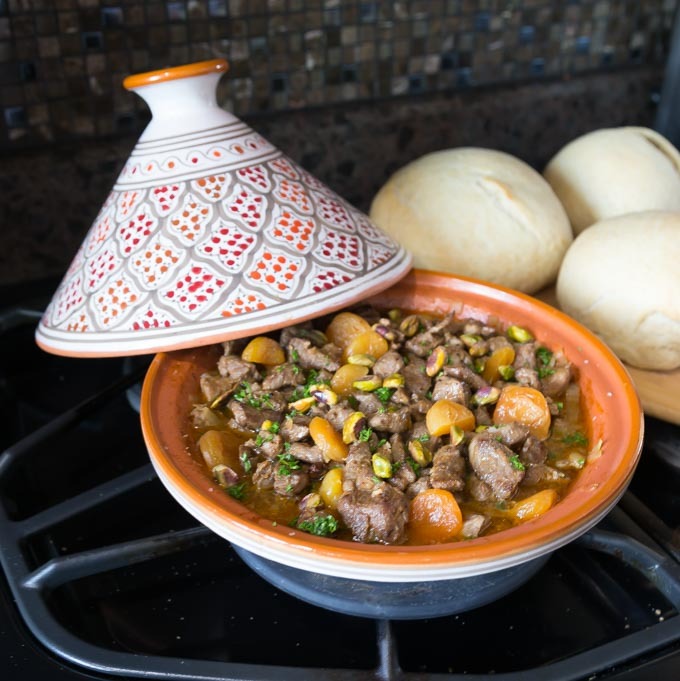 Enter traditional lamb tagine with apricots! I started playing around with what I thought would be the appropriate seasonings. Well, I guess I succeeded, because everyone raved about it. So what is a tagine? For those who are not familiar with the term, a tagine is a two part clay cooking vessel common throughout North Africa. The bottom part is a shallow bowl, and the top is a tapered rounded cone-like piece topped by a knob which in turn is vented at the top. The clay allows for slow cooking which infuses the food with fabulous flavors. There are various styles, from simple solid colors, to beautifully embellished models. The tagine was developed centuries ago as a portable oven, and was first used by nomadic tribes. As far as how old it is… well, it was mentioned in One Thousand and One Nights. A tagine-like vessel was also used in the times of the Roman Empire. The tagine has evolved over the centuries, and no two recipes are alike. For example, some tagines include prunes, dates, olives or preserved lemons, and sometimes a combination of all of them. Apricots, as in this recipe are also popular. Two words of warning: to use your tagine vessel on the stove top, you will need a metal plate (see above) on which to rest the shallow bowl. This piece is necessary to prevent the bowl from breaking. It is normally sold separately. The other advice, is to cure your tagine before cooking in it for the first time. I have extensive instructions on the curing process on my recipe for Moroccan chicken tagine. 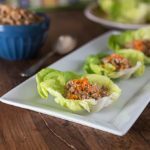 In my traditional lamb tagine recipe with apricots, these add a lovely sweet accent and texture to the dish. The pistachios add a bit of a crunch. 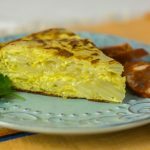 This recipe is a true fusion of flavors, and textures. Parsley adds a punch of color, and herbal tones as well. for this task. If not, use your sharpest knife. The potatoes should be added within 30 minutes of the tagine being done. The photo above shows the tagine dish just before I added the potato slices. Do not skip the marinating step. This is really important in order to allow all the flavors to penetrate the lamb. 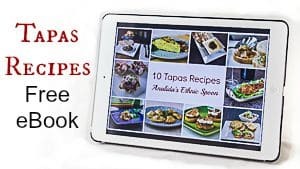 Now, if you do not have a tagine dish, and do not want to invest in one, you can prepare this recipe in a slow cooker, a Dutch oven, or even a braising pan. The trick is to cook it nice and slow. 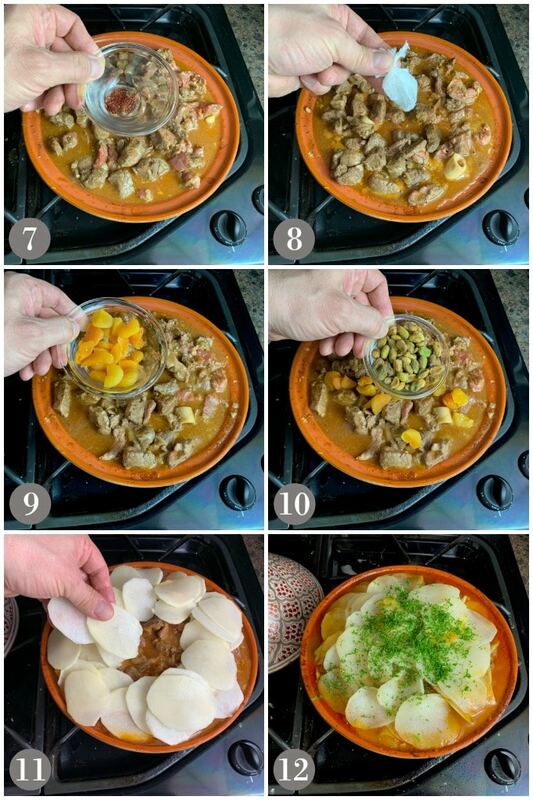 The potatoes should be added towards the end, just like you would when cooking in a tagine dish. Step 1: Gather all your ingredients and this means, chop, measure, slice and have them all ready. This is key to making this dish. Step 2: Add the spice mixture to marinate the lamb. Combine the olive oil, minced garlic, salt, cracked pepper, cinnamon, ground coriander, paprika and ground ginger. Mix this thoroughly by hand into the meat and refrigerate for 3 hours or overnight if you wish. Step 3: Place the onions in the tagine base and sprinke with a little dusting of salt to sweat them down for 20 minutes until soft on medium heat. Step 4: Add the lamb and break up any pieces that are stuck together. Stir and cook while browning the lamb for 20 minutes. Step 5: In a bowl whisk together the vegetable broth, corn starch and tomato paste until well combined. Step 6: Add the broth mixture to the tagine. Step 7: Add the saffron threads to the tagine. Step 8: Add the cardamom pods wrapped and tied in a cheesecloth to the tagine. Step 9: Add the apricots. Step 10: Add the pistachios then cover and cook on low for 1 hour. Step 11: Add the sliced potato in concentric circles to cover the simmering meat. Cover and cook another 30 minutes until the potatoes are soft. Feel free to ladle out and excess liquid during the cooking process. Set this liquid aside and keep it warm to serve later on the side. Delicious! Step 12: Sprinkle with the chopped parsley and serve. While cooking the tagine, my house smelled wonderful. Three hours after finishing dinner we could still smell the amazing aromas of my traditional lamb tagine with apricots. 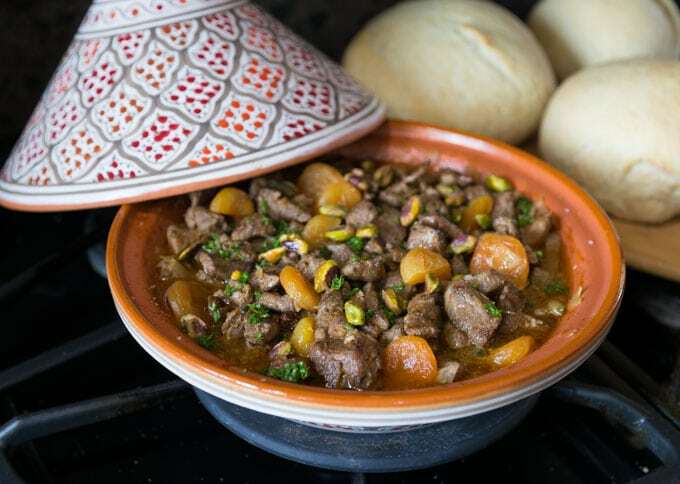 Make a traditional lamb tagine with apricots for your next gathering, or Sunday meal. Your family and guests will ask for more. 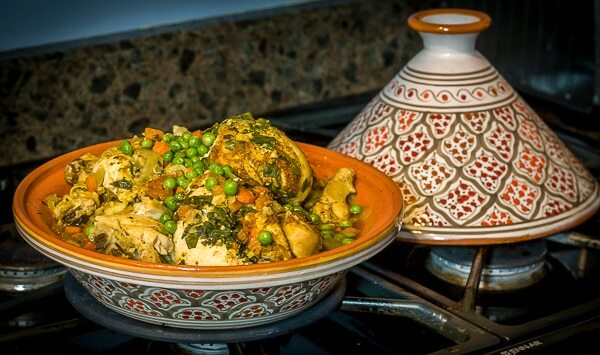 If you want to try your hand at another tagine recipe, check out my Moroccan chicken tagine. Easy and delicious. 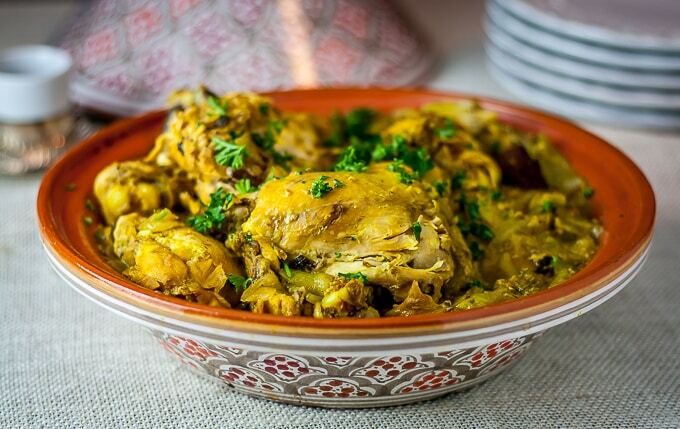 There is also Moroccan saffron chicken, which is one of my favorites. Another Moroccan dish you might also like is this hearty Moroccan chickpea and lentil soup. And let’s not forget Moroccan country bread. 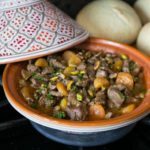 This recipe for traditional Moroccan lamb tagine with apricots is perfect to feed a large crowd. In essence it's a stew that is cooked slowly in a tagine dish. The flavors of aromatic spices will fill your house with a wonderful aroma. 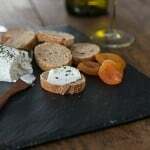 Apricots and pistachios add a wonderful texture contrast. In a small bowl mix together all the spices. Place the cut up lamb in a glass dish, and drizzle with the olive oil. Mix in thoroughly with your hands. 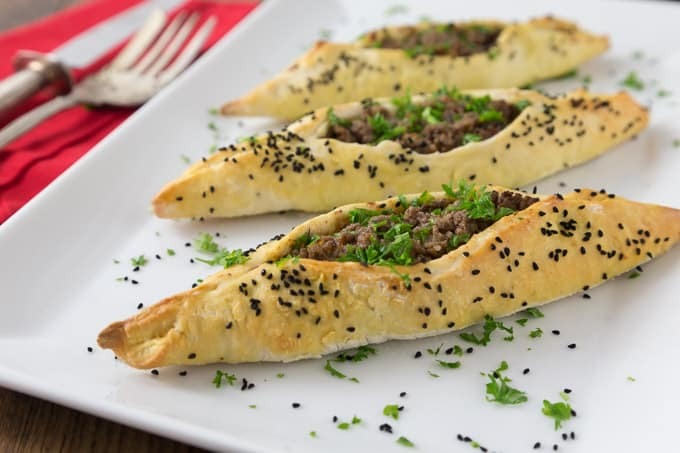 Evenly sprinkle with the spice mixture, and again, mix thoroughly with your hands. Place the onions on the bottom of the tagine dish, and sprinkle with salt. Sweat them down for about 20 minutes on medium. Slowly, add the meat, and break up any pieces that are stuck together. Cook for about 20 minutes, uncovered, and stirring often. In a bowl, whisk together the broth, tomato paste, and cornstarch, and add to the meat. Add the saffron to the tagine. Stir to combine. Wrap the cardamom pods in a piece of cheesecloth and tie with a piece of twine. Add to the meat and broth mixture. Stir in the apricots and pistachios. Cover, and cook for 1 hour on low. 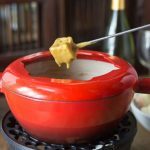 Feel free to ladle out and excess liquid, keep it warm and save for later when serving. Line with the potatoes forming concentric circles over the simmering lamb. Cover again, and cook for an additional 30 minutes, or until the potatoes are soft. Sprinkle the parsley on top. Here are some notes on using a slow cooker instead of a tagine. Most slow cookers cook on high and this is the correct setting for this dish. You only need to check the chicken with a fork for doneness. It should be very tender and separate very easy. At this point you can add the layers of potatoes on top. Cook the potatoes until they are just soft. Wow! Great knowing you could still prepare the Moroccan Tagine. I love the exposure you have regarding intercontinental dishes. 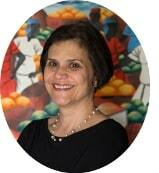 Thanks Binta! I love ethnic food, it is so delicious and varied. 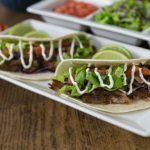 Hopefully you will get to try one of these dishes sometime soon. Tagine really does have an interesting history, the combination of all the tagine recipes would be something I would love to experience. 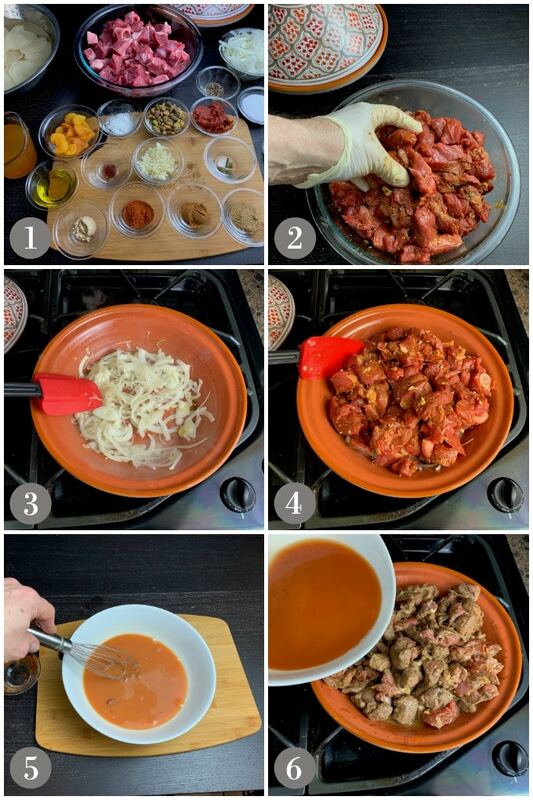 Zack give a tagine recipe a try. You won’t regret it. I love cooking with my tagine. Lamb cooked this way is so delicious. Love the combination of spices, and leftovers would be amazing (and even taste better the next day). Yes! The re-heated tagine leftovers are amazing as well. As I read the ingredients and spices I can almost smell the wonderful aroma! 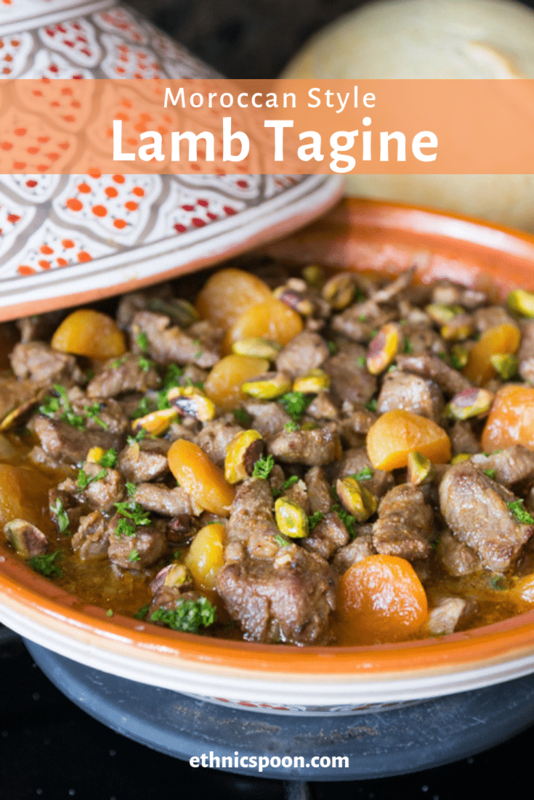 I’ve never tasted Moroccan Lamb Tagine but I’d love to try it out. It sounds quite exotic but my gosh the idea is making my mouth water. I wonder if I could borrow a tagine? I’d love to loan you one! I have two and one is a gift from a Moroccan friend. 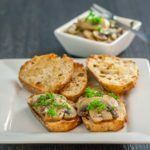 You can make the dish in a slow cooker as well. Enjoy! I need to get a Tagine. I’ve been thinking about it for a while, but your recipe has made my thinking about it to I HAVE to. I love lamb and this dish looks so delicious Analida! A slow-cooker works nicely as well but you can bring the tagine to the table to serve in a lovely presentation. Thanks! Wow this looks just delicious! 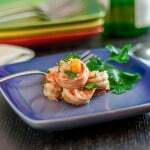 I must get a tangine dish so I can try this yummy recipe. I love the addition of the apricots and pistachios. What an enticing combination! 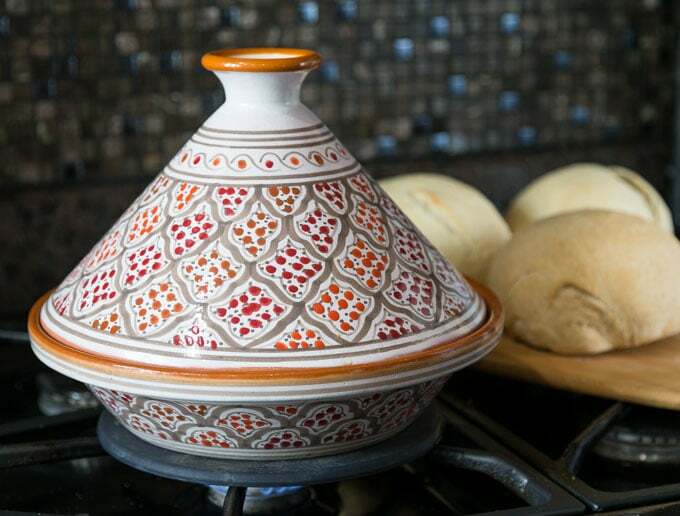 A tagine makes a nice cooking vessel and serving piece also. Enjoy! The Tagine is an item on my list to buy. I use to own one a long time ago and never got another after that broke. I love lamb and especially Moroccan spices. Looks so delicious. Ok YUM! I’ve never cooked in a tagine! I”m so going to have to try it! 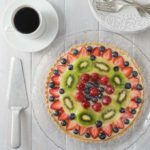 The ingredients in this recipe are so delish…my favorite flavors! Can’t wait to try this! The combination of spices is so worming and juts brings me back to North Africa, where i have been many times! So many memories! This looks so delicious, my mouth is watering at the thought of the first spoon of this dish. Moroccan food is one amongst many of my favorites. I love the use of spices and the sweetness of the apricots. I can only imagine the flavor of that lamb, so tender, melt in your mouth get on the flavor train good! You have me craving a tagine dish now. I think I will dust mine off and get slow cooking! 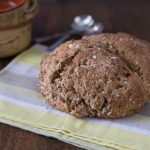 I have never made this, but I think I’m going to have to give it a try real soon! 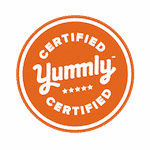 Thanks for sharing info on tagine. Your recipe sounds so flavorful with the combination of spices. So yummy. Pinned! I never had this soup before but I would absolutely go for a bowl of it right now! This looks amzing! Where does the saffron come in? 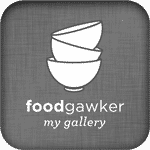 Hi Lauren, I am just updating this recipe as we speak with step by step photos. The saffron is added in step 4 when you add the broth mixture to the meat. Let me know how you like it! I just made it this weekend and the family loved it!